TOBAM, or Think Out of the Box Asset Management, the creator of the index this fund tracks, devised a clever way of measuring diversification. It uses the ratio of the weighted average volatility of a portfolio’s holdings to the portfolio’s volatility, which it calls the Diversification Ratio. This is based on the idea that diversification should reduce the portfolio’s risk rela­tive to the risk of its holdings. The diversification ratio is larger for portfolios that hold assets with lower correlations to each other because uncorrelated risk largely offsets at the portfolio level. The fund seeks to build a portfolio that will maximize this diversification ratio under a set of constraints. It starts with all U.S. stocks with at least $5 billion in market cap and decent trading volume. To rein in tracking error relative to the market-cap-weighted version of its starting universe, the fund limits its active share to 50%. Tracking error has still been high–ranging from 3% to 6.6% over the rolling three-year periods from the backfilled inception of the fund’s index in October 2002 through July 2018. This is because the fund tends to favor stocks with a high degree of firm-specific risk that isn’t highly correlated with the market. This strategy is only as effective as the measures that go into it. Correlations aren’t stable, so a combination of stocks that might have reduced the volatility of the portfolio in one period may not be as effective in the next. That said, relative correlations are more stable than absolute. For example, General Motors (GM) and Ford Motor (F) will almost always have a higher correlation than General Motors and Facebook (FB). To further address the potential stability problem, the fund gives greater weight to more-recent volatility, based on the observation that relative volatility tends to have stronger persistence in the short run. This approach leads to a defensive portfolio. The fund tends to tilt toward stocks with a high ratio of firm-specific (idiosyncratic) to nondiversifiable (systemic) risk because they typically have low correlations with one another. These stocks tend to have lower-than-average sensitivity to market risk (market betas of less than 1.0), though the fund still includes some names with high market risk. Nationwide launched this fund in September 2017, so its record is limited. But the performance of its index (which was back-tested prior to November 2011) suggests that it would have held up better than the Russell 1000 Index during market downturns, as expected. So, it’s not surprising that its performance relative to the market is positively correlated with the defensive MSCI USA Minimum Volatility Index. This suggests that they behave somewhat similarly. But this is not just a repackaged minimum-volatility strategy. It has less exposure to low-volatility stocks than those strategies, and it probably won’t offer quite as much downside protection or suffer as much when those stocks are out of favor. Indeed, the fund’s index has tended to keep pace with the market during market rallies over its life, while most minimum-vola­tility indexes lagged in those periods. The fund has limited exposure to most style factors, though it has a slight small-growth tilt. However, it does exhibit significant sector tilts, underweighting industrial stocks, as well as the market’s largest sectors, like technology and financial services, and overweighting consumer (defensive and cyclical), healthcare, and utilities stocks. These sector tilts contribute to the fund’s high tracking error to the market and can have a big impact on performance. This strategy does not rely on market inefficiency or mispricing. Rather, it is designed to better capture the equity risk premium by minimizing exposure to risk that the market does not compensate–risk that can be diversified away. 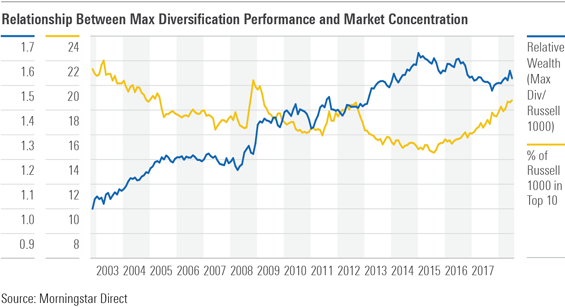 TOBAM argues that this strategy should perform well relative to the market when market concentration declines and struggle when market concentration increases (among stocks or sectors). This is because when market concentration increases, the stocks and sectors with the largest weightings in the index, which this fund underweights, have outperformed. When market concentration falls, it’s because the areas of the market have underperformed, and in those environments, the fund’s underweighting of those securities should help. Consistent with these expectations, the performance of the fund’s index relative to the market from October 2002 through July 2018 exhibited a strong negative correlation with the percentage of assets invested in the Russell 1000 Index’s top 10 holdings. The exhibit below shows this relationship graphically. It shows the ratio of the growth of a dollar invested in the TOBAM Max Diversification USA Index relative to the Russell 1000 Index (relative wealth) against the percentage of assets in the Russell 1000 Index’s top 10 holdings. The correlation between these two measures was negative 0.79, indicating that the fund tended to outperform when market concentration declined. It’s hard to predict whether this fund will offer higher returns than the market over the long term, despite the strong performance of its index during both its live and back-tested record. I’m not convinced yet. But it does more effectively diversify risk, which should lead to better downside performance and slightly lower volatility than the market, with better upside participa­tion and less style risk than low-volatility strategies. Its 0.34% expense ratio is a little high, but overall this is a promising strategy worth watching. Alex Bryan, CFA does not own shares in any of the securities mentioned above. Find out about Morningstar’s editorial policies.